Negative ads. Robo calls. Finger pointing. Divisive politics... How did it come to this? Is that what Ohioans deserve for being a key battleground state? With Ohio once again in the spotlight of an important presidential race, the Ohio Historical Society partnered with No Labels, a Washington-based movement seeking bipartisan political reforms, to host this panel discussion. 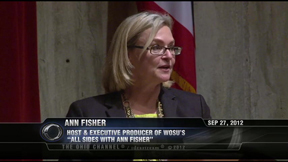 Ann Fisher, host and executive producer of WOSU's "All Sides with Ann Fisher", moderates the panel.